Like I mentioned a while ago - I attended the Austrian Wine Summit in Vienna recently and had a wonderful time - sampling wines, understanding the wine regions of Austria and taking in the breathtaking countryside. I wrote earlier about exploring the Niederösterreich region of wines. This next meal explored the wines of Burgenland, along with some of the local delicacies. 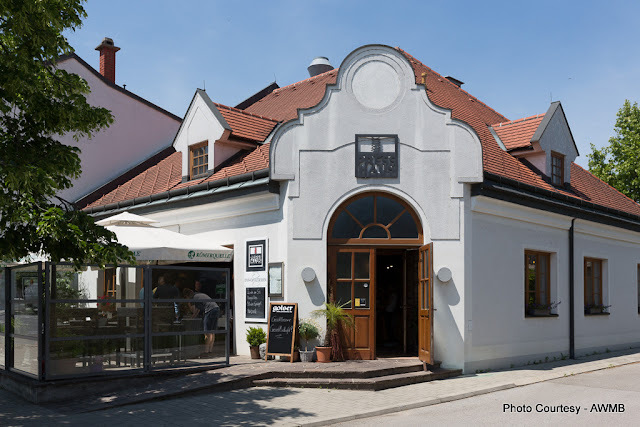 The meal was organized at Press Haus Haider in Illimitz in Burgenland. With the sun beating down on us that day, we made our way, from Wagram and our Kellargasse experience to Burgenland. We drove along the beautiful riverside to a quaint little town where the equally quaint Presshaus Haider is located. Stepping in, we were welcomed into warm wooden interiors by Bradley Knowles, who was the host and the curator of the wine and meal for the afternoon. Bradley, originally of Australian origin, and a sommelier came to Austria to help set up a high-end hotel several years go. The intention was to return once the job was done. But so enchanted was he with the country, that here he is still is, several years later. 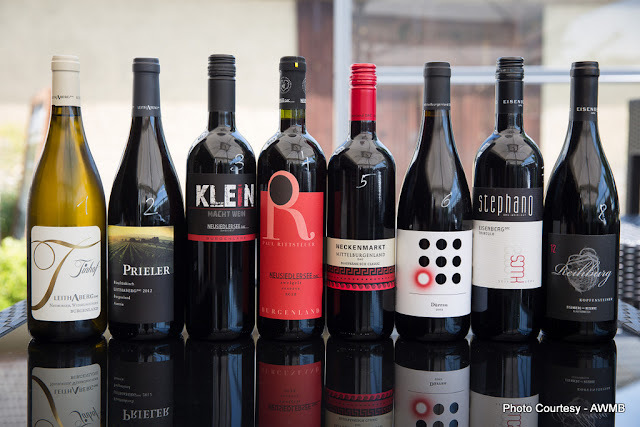 There is a lot to know about the wines of the Burgenland region and you can read it all on the hyperlink. This afternoon, we sampled wines from Mittelburgenland DAC, Eisenburg DAC, Leithaburg DAC and the Neusiedlersee DAC. Illimitz, where we were having our meal is considered to be among the top 4 in terms of sweet wine production. What is important to know is that this (Burgenland) is a diversified region which means that the best of all varieties is available here. The meal began with a fresh watermelon gazpacho as an amuse bouche. Light, mildly chilled, it was what we needed after our long bus drive. This was served with the first wine of the afternoon - A sparkling Pinot Noir called the Secco Rose from the Hillinger Winery. The grape for this wine is grown over 200 hectares and it proved to be a light one with a lovely strawberry base. With this Aperitif done, our first course was a salad, with Goat's Milk Cheese from Gols. This was served with a Pinot Blanc (2014) from the Lehendorf vineyard owned by Unger Yosef u. Maria. This was a light, sparkling wine as well and helped balance out the cheese and green. It complemented the freshness of the salad with its light floral base. The cheese salad was quite spectacular, with the creaminess of one cheese and cottage cheese-like texture of the other playing well with fresh crunchy salad greens. The mint/basil vinaigrette worked really well as a dressing. For the main course, it was a choice of fish or beef. I opted for a medium-done beef filet that was placed on a vegetable risotto. Some of the meat jus was placed as the base to make the dish more moist. The quality of meat was undoubtedly really good. This dish was paired with a Pinot Noir 2012 by Judith Beck, one of the only 11 women winemakers in Austria. This wine paired with the beef well - the lower level of tannins allowed for the flavours of the meat to shine through. The risotto was rather creamy in texture, with a nice bite to the rice. It acted as a balanced foil to the rich meat. It paired exceptionally well with the fish that was the other offering from the meat eaters, especially since the lower tannin levels helped the mouth savour every morsel in a heightened manner. The vegetarians feasted on the vegetarian risotto, which was served to the others a base to their meats, as the main, along with some of the locally grown asparagus. Dessert was a pretty plate of Strawberry and Chocolate Parfait. While the chocolate and strawberry do look very pudding-like in the image, they were frozen goodies that you could take your time with. The rich whipped cream on the side added to the sumptuousness of the dessert. This dessert was served with a very sweet wine of 2013 vintage from the Pandkraftn vineyard. It did pair rather well with the dessert, but honestly am yet to develop a liking for sweet wines.